I’ve already spoken about ways to integrate print with your social media marketing, but sometimes actions speak louder than words. It’s one thing to talk about designing for social media in theory and quite another to see successful examples with your own two eyes. The following print marketing campaigns have the right idea—they perfectly combine stunning and captivating print media designs while focusing on promoting their social media presence. 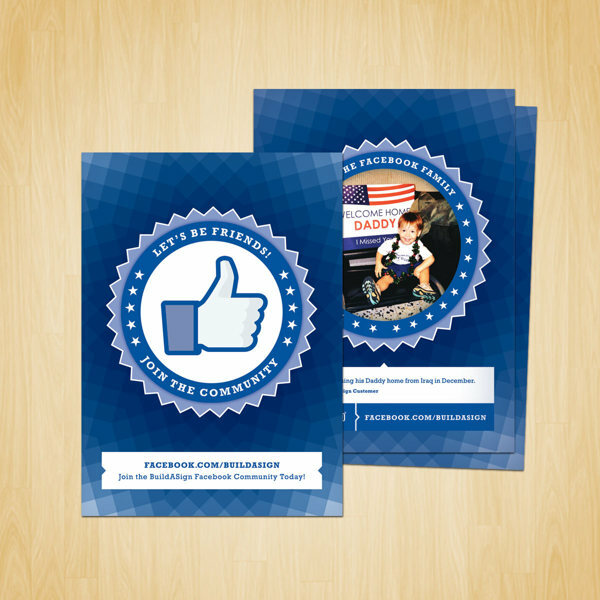 Get inspired for your next marketing campaign with these socially-integrated print designs. Near-field communication allows the audience to directly connect to a website or media file by tapping their NFC enabled mobile device against an NFC poster. However, it’s not enough to just have the ability to connect with your audience; you need to give them a reason to. This Social Passport poster asks the audience to use the NFC features to post about their experience on the brand’s social media site. The reward for doing so is a free breakfast. This encourages people to try out the NFC feature and actually make a social connection through it. When people talk about a subject on Twitter, they often use hashtags to connect with other people talking about the same topic. This poster design encourages social interaction on Twitter through the use of a custom hashtag. The Grammy Awards are a big event and it can be hard to get the entire audience to commit to one hashtag. You might see #Grammy, #GrammyAwards, #Grammys, #TheGrammys and so on. Encouraging the use of a specialized hashtag (#TheWorldIsListening) allows for a more streamlined way for users to connect with one another. It also allows you to see how effective a print marketing campaign is by observing how many people actually utilize the custom hashtag. This design also utilizes NFC features, but pay attention to the way it encourages audiences to connect with the brand. The copy uses action verbs like “Read,” “Share” and “Follow” to give the audience simple, yet direct commands to follow. When trying to convince the audience to connect via social media, a simpler process makes it more likely that they will actually participate. The design highlights the action words in a bright yellow color so that they stand out and guide the audience into taking action. Upon first glance, the audience can immediately understand how to socially connect with the brand. A business card is one type of print marketing media where a social media presence is absolutely crucial. After all, what good is a business card if it doesn’t contain all of the ways to get in touch with a brand? The bigger your social media presence, the more you would want to showcase these profiles on your business card. 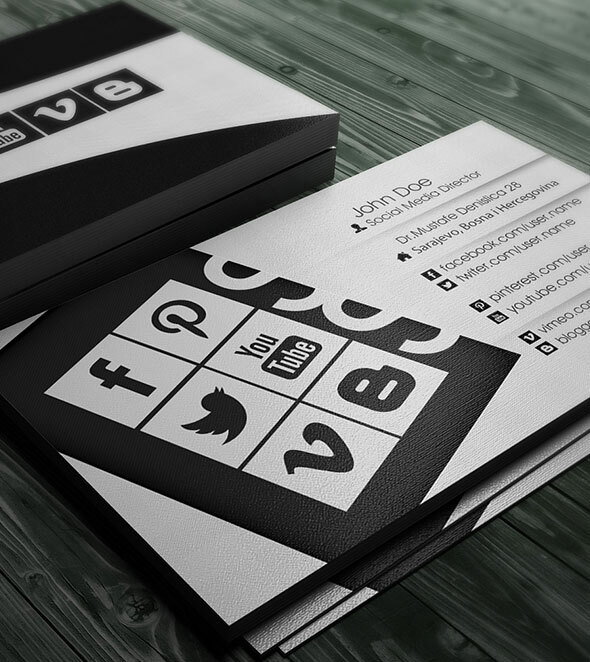 This business card design puts social media first by using iconography related to various well-known sites. The large buttons are reminiscent of icons on a smart phone screen, while the smaller buttons next to the social media URLS help the reader to quickly identify them. With so many social media profiles, it gives the audience their choice of connecting in whatever way they prefer. Social media is often overlooked in folder design, but remember that folders are often used for business presentations, and there is no better time to ask for a social media connection than after a presentation. This presentation folder mockup from CompanyFolders.com incorporates social media icons on the back cover, which makes the most design sense. For one thing, the back cover itself is one of the most neglected areas in a folder design, despite the fact that back cover printing is included in the cost of one-sided printing. The back cover also represents the logical end to a presentation, which is when one would want to push social media connections to the audience. They will expect social media buttons at the end because it mimics a blog or website, which places social media share buttons at the end of a post or the bottom of a page. The ACLU is a large scale organization that has a number of different functions, so this flyer embraces the different facets of the group, allowing the audience to choose which site is the most relevant to their interests. Each subgroup of the organization is given its own social media site and the flyer helps to explain what each group hopes to accomplish. With such a diverse organization like the ACLU, it makes sense to use multiple accounts instead of just one blanket account so that people can get involved in whatever cause matters most to them. Many people have passions about one cause but care little for another, so this splintered approach creates a sort of ala carte option for social media. In some cases, you want your business card to connect your audience to one centralized social media hub. This business card was designed to attract the audience to a LinkedIn profile. It has an NFC feature that allows the audience to quite literally link into the LinkedIn account via their NFC enabled device. 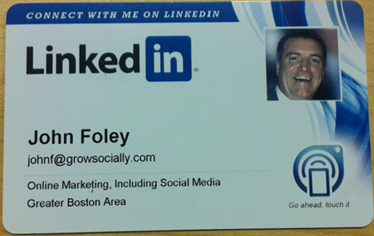 The card itself acts like a portable, physical version of a Linked In profile. Since the social media site can provide more information than what is possible to put on a business card, the card instead acts like a sort of key that allows access to that info. This Twitter-centric social media card uses design cues directly from the Twitter website to create the look of an actual tweet. Since tweets are small social messages made in real time, this faux-tweet card makes it look as if the presenter is commemorating the moment when the business card is handed off. This helps to establish a stronger connection, so that when the recipient looks at the card later, they will remember the very moment in which they received it and will have a better recollection of the brand. This design also utilizes a text message service for recipients to subscribe to the presenter’s Twitter feed. One could argue that this is more useful than QR codes or NFC features, as most phones (even non-smart phones) can send text messages. QR codes make it easy for the audience to make a connection via social media, but the codes themselves are often difficult to work with from a design standpoint. They can stand out in an obtrusive way or take the audience out of the aesthetic experience. However, this poster for the School of Visual Arts turns the QR code itself into a work of art. This design takes the bars and dots of the QR code and turns them into an urban landscape complete with buildings, roads and even taxi cabs. When the audience follows the QR code, it takes them to the school’s profile on Vimeo, allowing them to view further works of art and video blogs from the school staff, as well as make social connections with students and faculty. This business card is another example of QR codes being repurposed into visual design elements. In this case, the QR code is incorporated into the Twitter logo, continuing the geometric QR pattern beyond the parameters of the standard “box” shape. This not only makes it look more appealing, but acts as an immediate cue to the audience that the code itself will connect with the brand’s Twitter profile. The back side of the card features one simple, bold statement: “Follow me.” The brand is letting the audience know that the best way to connect and learn more about the company or individual is via Twitter. This creates an air of mystery, which will have recipients following the instructions on the card out of sheer curiosity. This mailer is the perfect example of social media and print media working in tandem. The mailer is sent to existing customers, thanking them for their business and asking them to make a connection via Facebook. This provides a way for the brand to touch base with customers after they’ve made a purchase, as well as drum up word-of-mouth sales and social media recommendations. The mailer specifically asks the audience to post about their positive experience with the brand and invites discussion and feedback. Testimonials are a great way to drum up interest in a brand, and this mailer is a great way to cultivate those testimonials. The thank-you card format creates a more personal touch than simply sending an e-mail asking the customer to make a social connection. Creativity is the name of the game. Without a captivating print design, you won’t have a captive audience and you’re not likely to see many social connections from your print marketing campaigns. It pays to have a professional handle the visual aspect of your print marketing campaign if you don’t have a talent for it. Many times, you can kill two birds with one stone if you choose a printer that has an in-house design team. If you’re struggling to create print media that integrates seamlessly with social, don’t be afraid to seek out assistance. The article is kindly provided by Jack Strutzas, a staff member at Company Folders, Inc.